P is at the age where the magic of Christmas is now making sense. We got to decorate the tree entirely this year. 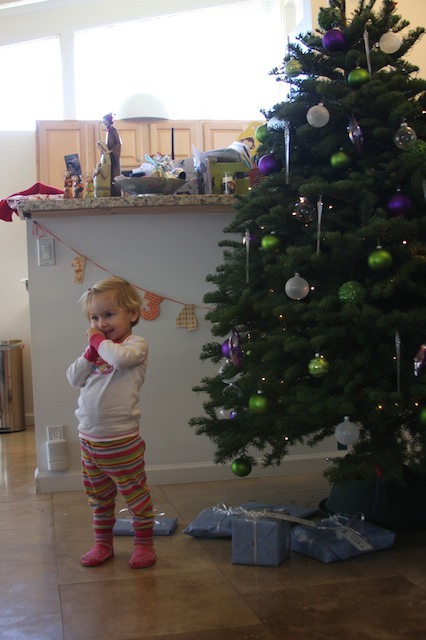 Last year we had to start the ornaments 2′ up from the bottom branch because she kept taking them off. She is being patient with her gifts and knows she has to wait to open them. However, because her birthday was not too long ago she calls all presents “happy birthdays”. We all have our own memories of Christmas. Mine involve mid-night Mass, few gifts and always playing one of the biggest junior tennis tournaments in the world, the Orange Bowl. Tennis took over making gingerbread houses or decorating with the lights or anything else about the holiday. It recently dawned on me that P’s Christmas memories are in our hands. We are about to start sculpting how she will feel about the holidays for the rest of her life. Lets face it, it’s our childhood memories that set the tone for this time of the year. With this in mind I’m making a list of what I want Christmas to mean to P and our future children. I want Christmas to have a feel of warmth and family. I want us to have special, traditional meals and to bake cookies and gingerbread houses. I want them to remember a home decorated with lights and great cheer. I want them to know the reason for our season as Christians but I want them to know it’s only one of a few interpretations for why we all celebrate. I want them to know its a time to give and share. I want them to get gifts but I do not want to make it about the gifts. I vow to not have a tree with tons of gifts under it, regardless of how well we are doing financially. With the toys and other “physical” gifts they get I also want them to get the gifts of responsibility, freedom, courage, strength. Gifts that are more gifts of life and growing up. I mostly want them to feel special and loved beyond anything ever known. I’m really not sure how I’m going to make all this happen. Maybe starting with a few goals and adding on every year will get the job done. i used to mope and mope about not getting to go home to PA for the holidays. my expectations for what christmas should be are extremely high (i grew up in bethlehem – the christmas city – for god's sake!). everything about christmas in CA bothered me. over the years i have discovered that it is what we make it. especially now that i have kids…the responsibility is ours…to make it special. grandma says it is about making memories so that is what we try & do. ice skating, going to look at christmas lights, decorating gingerbread houses, making cookies, etc. i know i'm still not there yet, but every year we get a little bit better! i struggle with the present thing. as kids we really didn't get much throughout the year. we didn't go on great big back to school shopping trips to get new clothes & overall we just really didn't have the $ to shop that much. my mom does NOT like to shop which is probably why i turned into such a shopoholic!!! christmas was THAT time where we got most of what we really really wanted. i battle to resist the urge to get too much for the kids. i'll have to work on that one b/c i know that is not really what it is all about! Previous Previous post: Ni Hao!